Restaurant reviews, recipes, and food talk from a Sconnie food lover. Why does everyone seem to love this place? When people come to town they always seem to have heard of The Old Fashioned and suggest going there. I have personally experienced this with friends and family, and I know others who have as well. This boggles my mind. The food is mediocre, and I say that only because I do enjoy their breakfast. Their menu is scant in my opinion and the service is terrible. I have just never been impressed by the place. Exhibit A: The first time I ever visited the Old Fashioned I was not impressed by the menu. There are not many healthy options on the menu and when I found what I thought sounded amazing and healthy (No. 35 grilled eggplant and portabella sandwich) turned out to have a highly unpleasant texture and zero flavor. Exhibit B: I arrived at The Old Fashioned for lunch when my sister and mom were in town and we were meeting a friend. The server got us water and took our drink order which seemed to take a while even though the restaurant was quiet at the time. After getting our beers my sister asked for some lemons for our beers. They never came, and we had to ask for them a second time, but by then we had almost finished our first beers. I ordered their summer sausage sandwich which sounded delicious, and it was okay. Very greasy, but okay. However, I left the restaurant feeling sick and crampy - not how I want to end a meal. Exhibit C: Now, my husband and I always forget that the Sunprint Cafe is closed on Sundays (which is incredibly silly and feels like a bad business decision to me, but anyways) and we end up walking up to the cafe and realizing this after we arrive. Therefore, we always end up having to choose another brunch option. Automatically we think Bradbury's, but then we usually get there and the line is out the door, which means waiting probably another hour before eating. At this point we probably have considered going to Gotham or heading somewhere down State St., but a couple of times we have made the decision to go to The Old Fashioned. The first time we made this decision I was very hesitant, but thought I would give them another chance on breakfast. It went well, the food was good, but again, not very healthy as half of our plate was covered in potatoes. Exhibit D: After having an okay experience for breakfast I decided to go to The Old Fashioned with my mom the next time she was in town. Again we were meeting up with a friend and thought it would be convenient since it was the same place we met the last time we got together. So, we get our coffee, etc. and are waiting for our food and when it comes out my mom's is cold. They take the plate from her and apologize, but bring it back a minute later. She's pretty sure they just threw it in the microwave or something. NOT IMPRESSED. I'm done with this place. I applaud them for using fresh and local products, but their representation of Wisconsin eating is sad. Some people say, "But what about the cheese curds?" and to that I say, "I prefer the curds at Graze." Horrible service, mediocre food, have left feeling sick more than once. The last six months have clearly been hectic for me. However, I can finally call myself a college graduate! I did not realize how fast my last semester would fly by and how hectic it would be. On top of the schoolwork I had a lot of things to organize, order, and finalize for graduation, and also had to deal with scores of holiday shoppers at work. With the holidays and graduation over I'm ready to get my life in order, start blogging again, buy a house, and get my career rolling. What career you ask? Well, I'm trying to figure that out for myself. For now, I'll just keep applying to jobs that peak my interest and see where it all goes. As for this blog, I'm going to continue posting. I might be branching out and writing about more than food, but whether that's the case or not, I'll be around. I have much more free time and am excited to blog again! Hey, it's been a while I know, but I'm trying to get back into blogging on a regular basis, and right now I need your help! It's sooooo hot in my apartment and we try to avoid running our portable AC because it really can only cool one room at a time and it uses a good chunk of electricity. This means that cooking in our 3rd floor flat becomes an extremely hot, uncomfortable task. I'm begging you for some dinner recipes that can be made without ANY cooking. Have a good gazpacho recipe? Hand it over! Hearty salads with a good amount of protein? I'll take it! We're dying here people! (not literally, but almost). Hope to hear from you all soon! Thank you! What’s With all the Sushi?? Madison seems to be turning into quite the sushi hotspot. Off the top of my head I can name four sushi restaurants within a mile of my house and more are coming!! The two times we have been here we have gotten the maki combo. It’s a great deal, and you get a good variety. It’s especially nice when you go with a lot of people because you can all share. 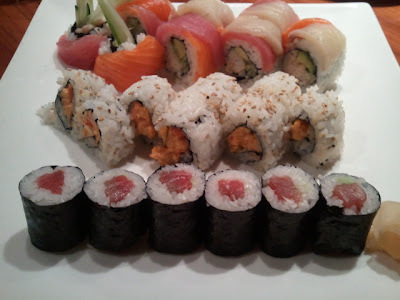 The thing about the maki combo…you don’t get to pick your rolls, the chef does! I think that’s awesome, but others might be pickier so keep that in mind. 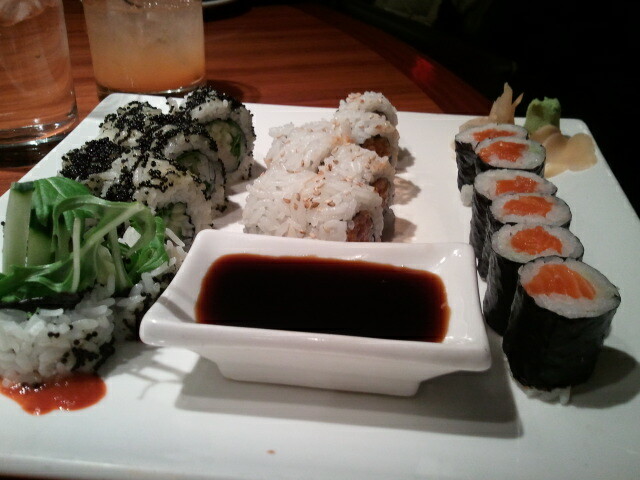 The maki combo gives you three sushi rolls, one regular, one inside out, and one special for $20. Inside out: Spicy Shrimp Roll (shrimp, masago mayo, scallion, seven spice, chili oil) - Umm…delicious. Special: Rainbow Roll (tuna, hamachi, salmon, crab, avocado, cuke) - A lot of fish, very filling, but good. I would try to eat/share most of this first so it doesn’t get too warm. Special: Dante Roll (hamachi, cuke, greens, habanero tobikko) -This one is VERY spicy…just a warning. I love spicy, but this was ridiculously spicy because of the black roe. But nonetheless, it was fun to eat. Everything was great and the atmosphere is awesome too. We usually sit at the bar so that we can watch the chefs cook. Sometimes it gets a little intense, but you can thank them directly when its great! 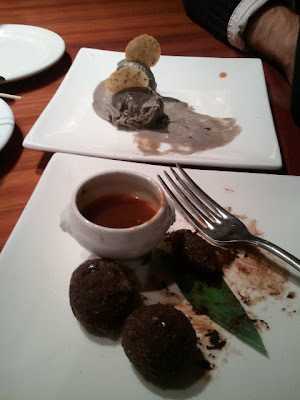 The top plate is the black sesame ice cream and below are the chocolate satsuma beignets with miso caramel. All of this was amazing. The beignets were great both with the caramel and with the ice cream. The ice cream itself was surprisingly tasty, and the miso caramel I seriously could have eaten by itself it was that good. A little pricey, but worth it once in a while for a great date night! Insider tip: Monday, Tuesday, and Wednesday nights its $25 for all you can eat sushi. Just FYI. : ). 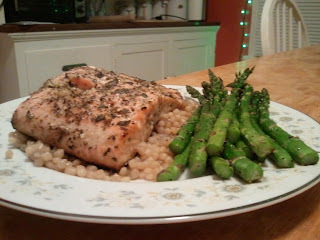 Baked salmon in a basil and lemon marinade, israeli style cous cous, and roasted asparagus. It was perfect! I marinated two fillets for about 45 minutes and then wrapped them in foil and baked it in the oven at 375 degrees for about 35 minutes. Turned out great! Add the butter to a pot on the stove set at about medium heat. Let that melt, then add the garlic, and the onion (peppers are good too if you have them). Let the onion cook a couple of minutes and then add the couscous and stir. Allow the couscous to toast, stirring occasionally for a few minutes. Add spices. Add vegetable stock and bring to a boil. Once boiling reduce heat and let it simmer until liquid is absorbed, about 10 minutes. This was so good, and the Balti seasoning was genius. Once I added it, the two of us could not stop smelling the dish and we couldn’t wait to eat it! Vanilla pound cake with homemade strawberry sauce and vanilla ice cream. 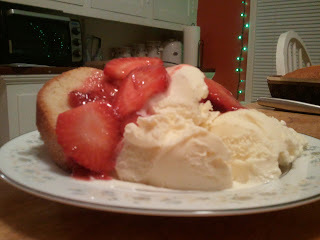 Put 2/3 of the strawberries, the sugar and the vanilla into a pot on medium heat. Stir with a whisk crushing the strawberries as they soften to form a saucy texture. Then add the rest of the strawberries and serve! MMM….I will definitely be making this for waffles and pancakes. 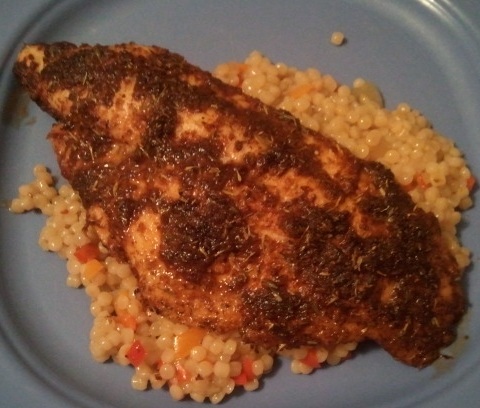 This Cajun catfish recipe is great and I have used it several times since I came across it. It is very versatile as well. I’ve used it with a couple different kinds of fish and it always tastes delicious. The first time I made this dish I followed the recipe closely, but I doubled it because I wanted a lot of flavor. Spread this on whatever kind of fish you like and bake it in the oven for its normal baking time. So much flavor!! You will love it! I used this recipe for 2 catfish fillets. The couscous is Israeli couscous, and one of the reasons this is a go-to dish for me is because I usually have some fish fillets in the the freezer and almost always have couscous in the pantry. You could use regular couscous as well, but I enjoy the texture of the Israeli type. To make the couscous add some butter to a medium sized pot and add whatever vegetables you think you would like. I really like peppers and garlic in this, but onions or zucchini would also be good. You can also add any spices or herbs you’d like at this point. Let the veggies cook a little and then add the couscous. Let it brown for a minute or two in the pan and soak up the butter. Then add stock of your choice. I chose veggie stock and the ratio should be about 2:1 stock:couscous. Allow it to simmer until the stock has been absorbed and the couscous is soft. 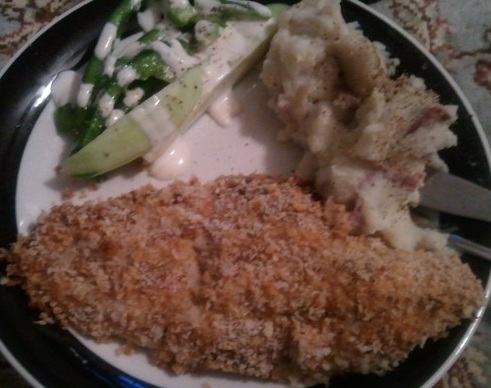 Now, I have used this recipe to make breaded fillets as well. Make the Cajun sauce as above, but add an egg. Dip the fish into that mixture and then into some panko bread crumbs. Then put in the oven and bake. You may want to season your bread crumbs though, I used a little salt, paprika, and cayenne in mine and it was great! Give it a try and let me know how you liked it!